Our day trip today takes us inland to George, the main town in this Klein Karoo region. 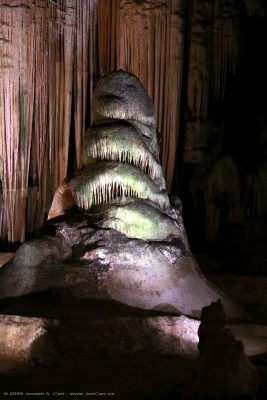 Our first stop is the Cango Caves, where we take the Standard Tour which only covers a fraction of what can be seen in the caves. The caves have dried out over the last few years because of lack of rain on the surface, however they are spectacular nonetheless. Next stop is Ostrich Show Farm near Oudtshoorn. A few of the lighter members of our group get to ride the ostriches. We stop in a mall in Oudtshoorn for a lunch break, and are entertained by the barking buggy boy in the parking lot. Yes, he barks like a dog…and seems to get a great thrill out of entertaining us while we wait for everyone to return to the bus from their various lunchtime activities. Scary? no Funny? certainly! This entry was posted in South Africa and tagged caves, ostrich. Bookmark the permalink.